Happy last week of June. Wow! It’s kind of hard to believe. This has been a crazy month, filled with beautiful flowers, celebrations, and changes. This is our last week for our busy season hours- starting July 5th we transition to our “Off Peak” Summer Schedule where we will be open Monday–Saturday 8:30-5 and closed on Sundays. In September, when things cool down, we go back to being open 7 days a week again. 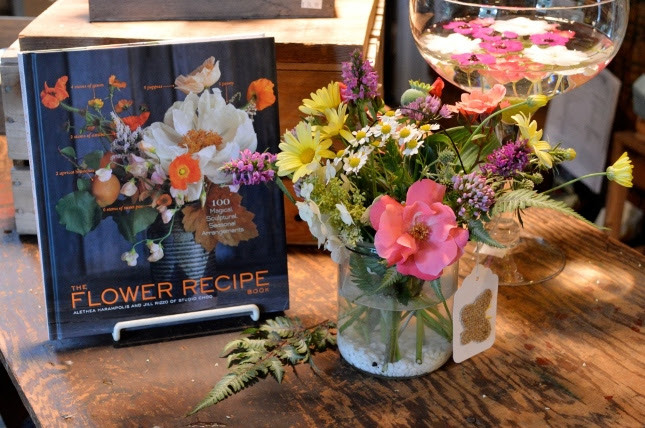 So this Thursday evening, come in and shop until 7 pm and enjoy the magic of Natureworks at that time of day. Yes, we are open our regular hours all weekend and Monday, July 3rd. We are closed, as usual, for the July 4th holiday so that my hardworking, exhausted staff can get a break and spend some time with family. 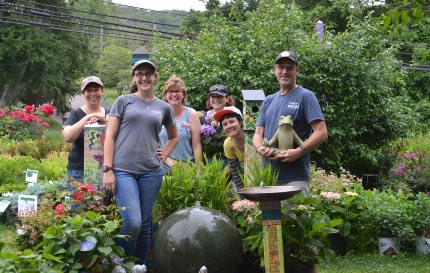 July brings many changes… For all of you who enjoyed working with Jan (shown on the right holding the frog), we want to express our gratitude and wish him luck on his move down south. Some lucky gardeners down there will be thrilled to take advantage of his vast plant knowledge. Thanks Jan! 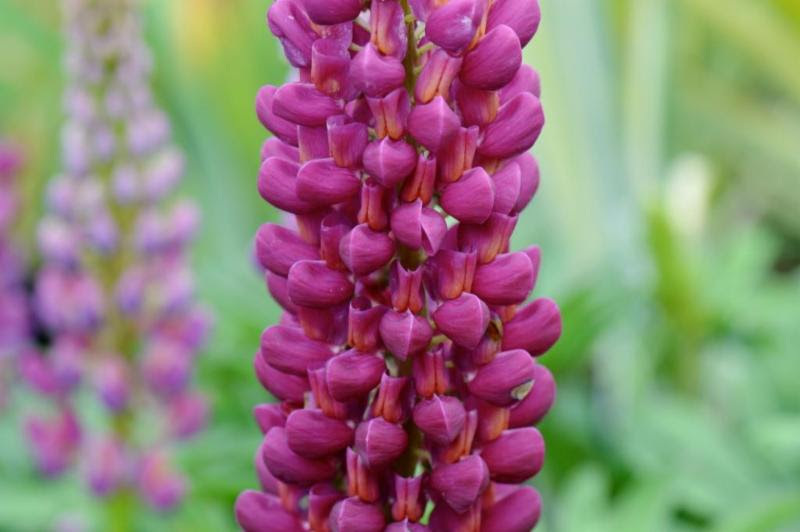 ‘Masterpiece’ lupine is part of the West Country series from England. They are one of the MANY plants on sale this weekend! To celebrate the 4th of July and this transition, Diane and I have been negotiating back and forth about what kind of sale we are going to have. At first I was like…”WHAT? Are you crazy?” Then we both started talking and agreed on a large bunch of plants that we want to see GONE, outta here, in order to make room for…wait for it… NEW PLANTS! 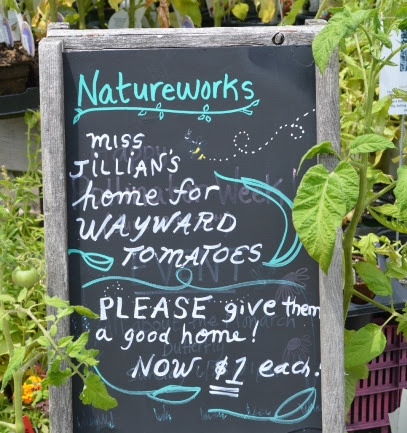 Call us crazy, but that’s how we roll in the summertime at Natureworks. So you are in luck, my friends. For four days, Friday through Monday, June 30th thru July 3rd, we are gathering tons of perfectly good plants and putting them on sale at 40% off. 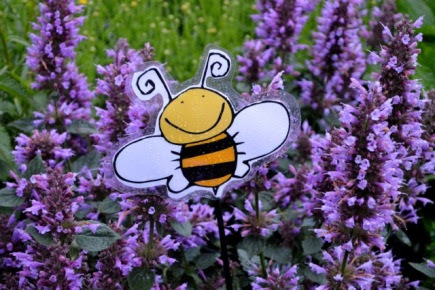 The list includes Campanulas, lupines, foxgloves, Salvias, Veronicas, Heucheras, Brunnera, Lamium, sweet woodruff, peonies, irises, Nepeta, Pulsatilla, Sisyrinchium, and a bunch of individual trees, shrubs, and hanging baskets that need a good home. profit organization that could use more tomatoes, peppers, and eggplants, please have them get in touch with us about a donation of plants to their garden. These organic plants are really healthy and gorgeous- a LOT of food could be produced from these plants! 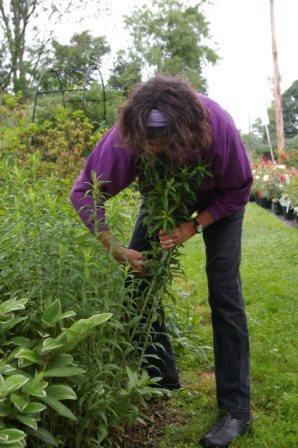 If your asters are as tall as my asters, you need to pinch them THIS WEEK! Tune in to Facebook Liveon Thursday at 5:30 and I will show you how. avoid cumbersome staking and to double the bloom period. That is exactly what we will be demonstrating and talking about this Thursdayevening on Facebook Live at 5:30. I spent most of Sunday in my home garden chopping away (as well as making room for more food plants and seeds). If you aren’t sure what to cut or how to do it, tune in and PLEASE ask questions! I LOVE questions! This Saturday morning marks the return of our Early Bird Sale. We have changed the time- shop between 8 and 9 am and you will get a $5 gift card good on any purchase of $20 or more. We will also be serving free organic coffee. 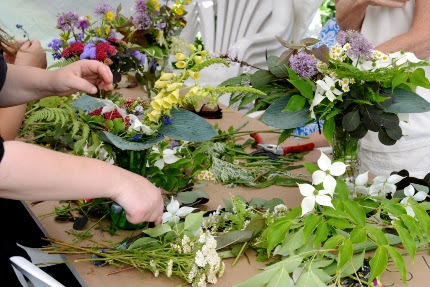 easy and fun it is to arrange flowers. You leave with the vase filled with your arrangement, hopefully to be refilled over and over as the summer and fall roll along. 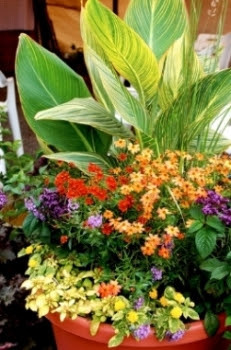 I want all of my customers to feel totally comfortable with growing and cutting fresh flowers, foliage, grasses, and berry branches from their gardens and landscape. It shouldn’t be complicated or intimidating and it makes life so much nicer to have home grown bouquets in your home on your patio or porch. It is truly one of the simple pleasures of gardening. 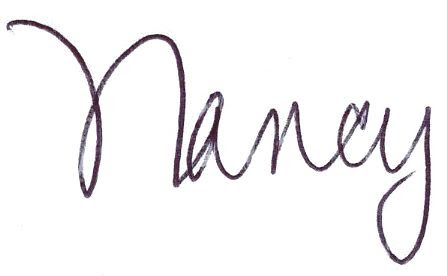 This class is limited to 8 people and is a really good deal- only $20. Details are below. Sign up today with a friend! Another thing I worked on over the weekend was planting a few more containers. I have some really large clay-like pots that I place in my borders to add extra color when some of my earlier blooming perennials finish up. This all started when I wanted to fill a huge gap left by “the bleeding heart that ate Middletown”. Then I went to England and saw this trick used everywhere. So I have decided to make it a tradition. Late last week I stuffed my car with a few more flats of really bright, colorful annuals and some more Organic Mechanics potting soil. You should see my borders now! To show their gratitude, hummingbirds visited the plants I had just added. Heaven. I love ‘Indian Giver’ daylilies. 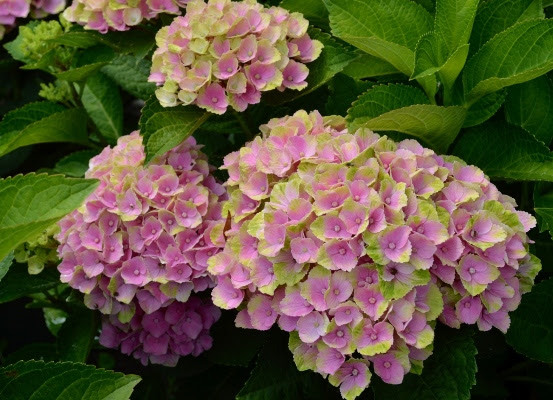 Besides the wonderful purple color, they have a 5-6 week extended bloom period. They are part of our Trophytaker line. There IS a difference. The times are a changing in the garden, that’s for sure. 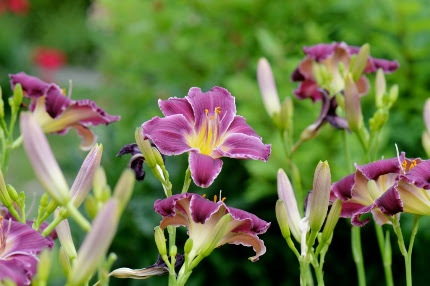 More and more daylilies are coming into flower, I saw my first Platycodon (balloon flower) on Monday in my garden, and many of our summer perennials and flowering shrubs are coming into their own. Hydrangeas are having a GREAT year, with many budding up and starting to flower on last year’s wood that actually lived over the winter. What a treat! I go out each morning and each evening and graze on sugar snap peas, red raspberries, and fresh blueberries. Every meal has something from the garden to make it special, and locally sourced. I am still planting, I guess I never stop. I am constantly looking for ways to fill in the empty spaces or punch up the color in one garden or another. I bet you feel the same way. And we are ready for you with tons and tons of wonderful plants of all kinds to fulfill your gardening heart’s desire. When June turns to July, we don’t stop, we restock and keep planting. The season is so precious, let’s do all we can to take advantage of this time of year. ‘Amethyst’ hydrangea is flowering this week. This is a reblooming variety that flowers on old and new wood. The color morphs and changes as the summer progresses. Make time to stop in soon-you will be glad you did!